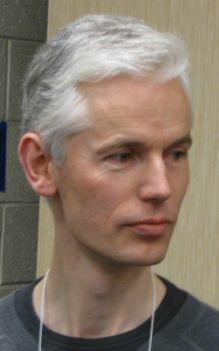 World renowned mathematician and Cambridge University researcher Timothy Gowers, who has pioneered part of the open science movement with his Polymath Project. If you’ve been reading my weblog for a while, you’ve possibly garnered some appreciation for one of my driving professional preoccupations: the need for Extension to develop a new outreach model over the next decade. I’m even more preoccupied after reading and rereading “Open Science: a Future Shaped by Shared Experience” an article by Bobbie Johnson that appeared recently in the Guardian, a British daily. I’ll even go out on a limb and predict that the open science movement may be every bit as far reaching to the future of humanity as the scientific method, first articulated by Roger Bacon in the 13th century. Open science is interpreted in several ways, but it essentially boils down to making scientific research more open, more public. Open science proponents contend that the traditional approach to research is not only a retrograde approach to inquiry but is also hindering progress. Opening up research — in many cases, crowdsourcing it — not only would revolutionize scientific inquiry but also render it more efficient, they argue. The article highlights eminent mathematician and Cambridge University researcher Timothy Gowers’s efforts to solve a handful of highly complex mathematical problems by crowdsourcing them — inviting other people to weigh in with their own suggestions for resolving them. He dubbed it the Polymath Project, an undertaking that ultimately produced a series of new ideas and insights as well as several collaborative papers published under the collective pseudonym DHJ Polymath. The potential of open science already has also been foreshadowed other areas of science, notably The Human Genome Project’s pioneering efforts to map and share DNA. Much of this parallels what has already unfolded within the computer software industry, Johnson says. Science is proving no more immune to the effects of Web 2.0 than any other facet of modern life. With the lowered transaction costs that have accompanied Web 2.0, much of the research that once required heavily funded research departments can now be conducted in a garage. The economic downturn has contributed too. Open science may prove a cost-effective alternative as governments around the world slash conventional research funding, proponents contend. Needless to say, the implications for Extension are profound. To a significant degree we’ve been involved in open science from the very beginning of our history. So much of what we’ve done has foreshadowed this trend. Even so, a respectable number of Extension educators, many of whom balance research assignments with Extension responsibilities, will steadfastly maintain that the advent of open science portends the end of science as we know it. Genuine scientific achievement, they would contend, is not possible without research — sometimes even centuries of research — which not only requires immense investments of time and manpower but, certainly in the case of many land-grant university researchers, mentally and physically taxing data collection, often in inhospitable research environments. Even then, the fruits of this research are wasted efforts unless they are shared with other scientific peers in one or more refereed scientific journals — along with painstaking data collection, a crucial step in the refinement and advancement of scientific advancement. For their part, many open science proponents freely concede that there is still a place for these rigorous research practices. But as Johnson observes, they are also right to point out that this highly formalized, institutional research is of relatively recent vintage and that some of the greatest advances in human history have come from autodidactic polymaths — self-taught gentlemen scholars such as Robert Hooke, Charles Darwin and Benjamin Franklin. My take, for what it’s worth: I see lots of promise and, yes, some peril in what’s taking place. The promising part is the valuable role Extension educators can serve as subject matter curators and in helping refine discussion within this new open, freewheeling knowledge environment. In some respects, it’s the same role we’ve played throughout the past century, although we will be dealing with a much more sophisticated audience who, by every conceivable measure, will no longer be clients in any conventional sense. Our historical experiences uniquely equip us for many of the challenges that lie ahead. We were not only early forerunners of open science but also of applied research methods. Now for the peril: I sometimes despair at the number of Extension professionals who fail to grasp the full implications of Web 2.0 and the imperative need to redefine our role as knowledge providers. To state it bluntly, I fear that we face the real risk of being sandbagged by the technological, social and cultural effects of Web 2.0. If we don’t learn quickly how to become effective players in this new environment, we will be quickly bypassed. We need to give serious thought to what it means to be a knowledge provider in the 21st century — and fast.